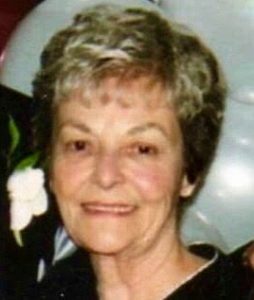 Glenna Cucchiara (nee Nelson), 89, of Northvale, passed away on Tuesday, October 2, 2018. Beloved wife of 68 years to Frank J. Cucchiara, Jr. Cherished mother of Donna D’Ercole and husband Joseph of Norwood and Frank J. Cucchiara III of Westwood. Cherished grandmother of Dawn, Kim, Frank IV and Joseph. Adored great-grandmother of Sean Jr, Jake, Jordana, Ashley, Shaylin, Shane, Siena, Frank V and Mia. Dearest sister of the late Shirley O’Brien and Lea Mulrane. A Funeral Mass will be celebrated Wednesday Oct. 10 at 10 AM at St. Anthony’s RC Church, Northvale. As a child, I remember Glenna as glamour; lipstick smile and laughing eyes. If I sit in quiet, I can vividly remember sitting with her during one of your family visits as she demonstrated her ritual of applying lipstick. Such memories are little gifts for little girls. My thoughts and prayers are with each of you, always and especially now. I hope you find comfort, joy, love and laughter in all of the wonderful memories that I know you will continue to cherish.